Edmund Lonnrot, AKA Eddie Red, has a photographic memory and a talent for drawing exactly what he sees. 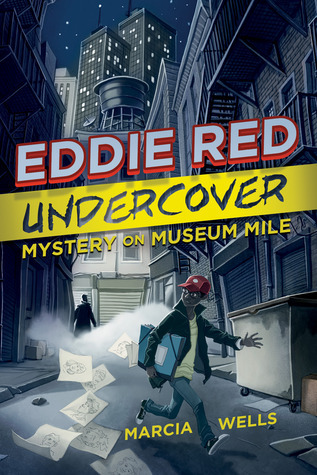 After being an eye witness to a serious crime, the police find Eddie’s drawing skill as a possible secret weapon in cracking a very difficult case involving cunning art thieves. They hire Eddie to work for the police department. Lucky thing too, because Eddie’s dad just lost his job and his parents won’t be able to send Eddie to Senate school for gifted kids unless they can come up with the tuition. There are so many things I liked about this story. The crime puzzle, the NY setting, Eddie’s friendship with his nutty friend, Jonah and his relationship with the tough, Italian Detective Bovano. But what I enjoyed the most was Eddie’s voice. I loved getting inside Eddie’s head and hearing all the funny, quick thoughts he had throughout the book. Hilarious! Very clever writing, plotting and pacing. Definitely a great middle grade book for boys! Congratulations debut author, Marcia Wells for a uber, terrific story. Keep them coming.